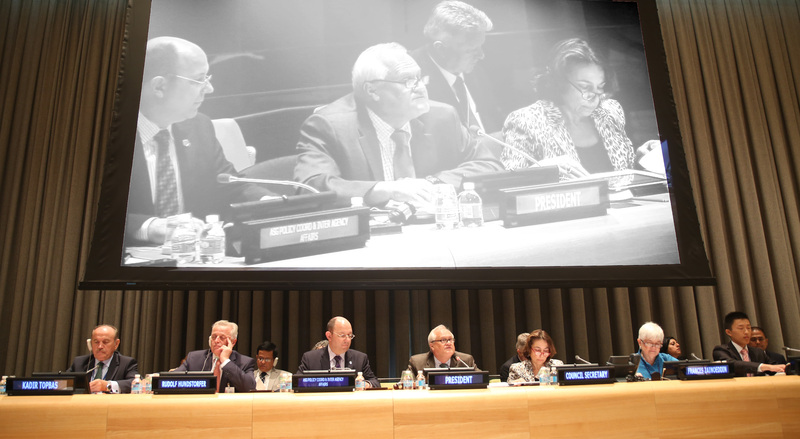 UCLG President, Mayor Kadir Topbaş, will represent local and regional authorities of the Local Authorities Major Group and the Global Taskforce at the opening plenary of the High Level Political Forum on Sustainable Development (HLPF) on the 26th of June at United Nations Headquarters in New-York. The High-level Political Forum was set up as the main UN platform on sustainable development, in accordance with Rio+20 recommendations. Its goal is to provide international political leadership and guide the follow-up to commitments on sustainable development. The Forum's annual meetings convened under the auspices of the Economic and Social Council (ECOSOC) produce negotiated ministerial declarations, based on consensus, while the summit-level meetings every four years will produce concise negotiated political declarations. From 2016 onwards, the HLPF will conduct regular reviews on the follow-up and implementation of sustainable development commitments and objectives, including those related to the means of implementation of the Post-2015 Agenda. While the HLPF has no enforcement mechanism to compel Member States to comply with its recommendations, it is likely to become the most legitimate and influential platform for regular dialogue and agenda-setting on sustainable development over the coming years. This meeting of the Forum is occurring at a potentially pivotal moment, with the UN Summit for the adoption of the Post-2015 Agenda to be held just two months later on 25-27 September 2015. The theme for this years’ HLPF is “Strengthening integration, implementation and review- the HLPF after 2015”. This theme is of strategic importance to the Global Taskforce’s ongoing advocacy for the localization of the Post-2015 Agenda, particularly its implementation, in which sub-national levels of government play a crucial role. Mayor Kadir Topbaş will speak at the opening plenary on the 26th of June on the role of local and regional governments in the new global partnership for sustainable development. A number of other mayors and local leaders have also been invited by the ECOSOC President to speak over the two week event. News of all these contributions will be published on the Global Taskforce website shortly. Read the full Statement delivered by Kadir Topbaş, Mayor of Istanbul, President of United Cities and Local Governments, representing the Global Taskforce for 2015 towards Habitat III.